We are tired therefore we make just a copy-and-paste of this extraordinary announcement. To read on Linkedin/Pulse. The « Swiss Center of competence for media and printing technology” (UGRA) is well known for its established certification process of proofs in the printing industry. The UGRA/FOGRA Media Wedge CMYK represents a proven and an industrial recognized approach for quality assurance. In this industry, standards are important and almost every proofing system is using the UGRA/FOGRA Media Wedge to certify contract proofs. UGRA developed a new digital control tool for the analysis and certification of soft-proofing displays, focussing on the evaluation of the quality of the display, the “Ugra Display Analysis and Certifcation” tool. This tool validates calibrated monitors to the ISO 12646 standard and is a widely used and acknowledged tool to test high -end LCD displays for the creative industry. The combination of the Cintiq 27QHD and Wacom Color Manager (powered by X-Rite) enables the demanding customer to calibrate and profile the Cintiq 27QHD to a very high level of colour accuracy. The result can be verified and certified by the independent UGRA tool, confirming the premium quality of the product. 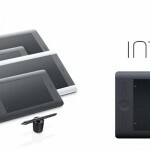 Cintiq 27QHD, UGRA, FOGRA, X-Rite, CMYK… SI avec ça, vous n’avez pas mal à la tête.